North Korean leader Kim Jong Un's announcement that he will suspend nuclear testing starting Saturday has been met with mixed reaction. The decision comes as North Korea heads into planned summits with South Korea and the United States, where denuclearization will be a key agenda item. It has resulted in some praise from experts and leaders worldwide and some critics. "North Korea has agreed to suspend all Nuclear Tests and close up a major test site," President Donald Trump tweeted late Friday. "This is very good news for North Korea and the World - big progress! Look forward to our Summit. The halt on nuclear testing comes amid news that Mike Pompeo, current CIA director and secretary of state nominee, recently met with Kim in North Korea to lay the groundwork for the summit with Trump, Military.com reported. Trump said in the Military.com report that Pompeo's meeting "went very smoothly" and said a "good relationship was formed." "Denuclearization will be a great thing for World, but also for North Korea," he said. However, Japan's Prime Minister Shinzo Abe urged caution. "This announcement is forward motion that I'd like to welcome. But what's important is that this leads to complete, verifiable denuclearisation[sic]. I want to emphasise[sic] this," he told Sky News. Japan's Defense Minister Itsunori Onodera added that Tokyo would persist with its policy of putting pressure on Pyongyang so that it ultimately gives up its "weapons of mass destruction, nuclear arms and missiles." British government officials reacted with a mix of praise and caution. In a statement in the Sky News report, the Foreign and Commonwealth Office said: "We remain committed to working with our international partners to bring about our goal of a complete, verifiable and irreversible denuclearisation of the Korean peninsula, and to do so through peaceful means." China, which is North Korea's main support, said the decision would "help ameliorate the situation on the peninsula." And Russia's foreign ministry in a statement that "we welcome" the announcement to halt the tests, saying it's "an important step towards further easing of tensions on the Korean peninsula and strengthening of positive trends on settlement of the Northeast Asian situation." But the ministry called on the United States and South Korea to "take adequate accommodating steps aimed at slowing down military activities in the region and reaching mutually acceptable agreements with the Democratic People's Republic of Korea at the upcoming intra-Korean and U.S.-North Korean summits." Critics said that North Korea had already announced that it had reached its goal of nuclear armament back in November, which is the reason that no more nuclear tests are needed. "This comes after it has been reported that the some parts of the nuclear site were damaged in the previous nuclear test. Also at a time when the North has already declared competition of its nuclear armament, there is no need for Pyongyang to carry out additional nuclear tests," Professor Koh Yu-hwan of Dongguk University in Seoul told the Yonhap News Agency. "The point here is that the North has completed its nuclear objective, signifying that now is time for economic development," he added. The summit with South Korean President Moon Jae-in is expected next week and the summit with Trump is expected in late May or early June. "The North also needed to establish a logic to persuade its own people before it discards its nuclear weapons program," he said. "That's why it did not specifically mention 'denuclearization' in the statement." 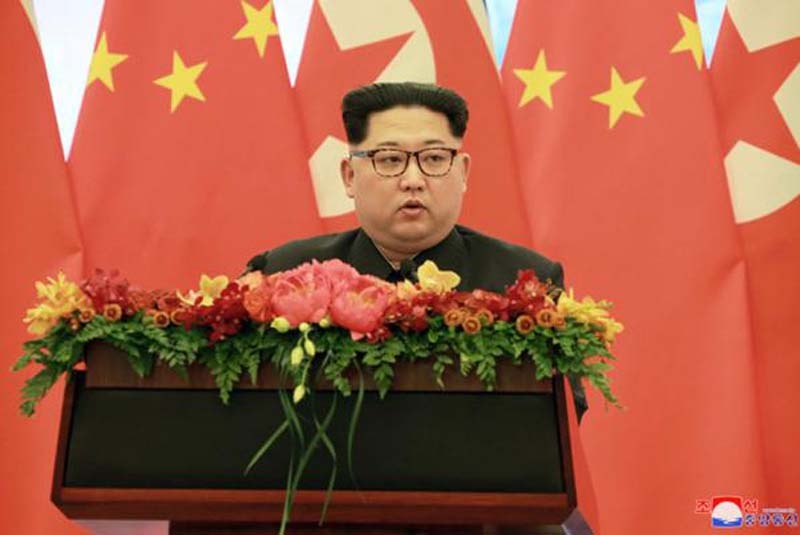 Kim made the announcement Friday that he would place a halt on nuclear and intercontinental ballistic missile tests and close a nuclear test site in the northern area to affirm the suspension on Saturday, Yonhap News Agency reported. He made the decision made at Friday's plenary meeting of the ruling Worker's Party of Korea that tests were no longer needed.